Still in coffee mode! Having just come back from a camping trip, I'm still remembering how much a nice, hot cup of coffee meant first thing in the morning - or in the afternoon - when you're out in the wild! (OK, even when you're home.) 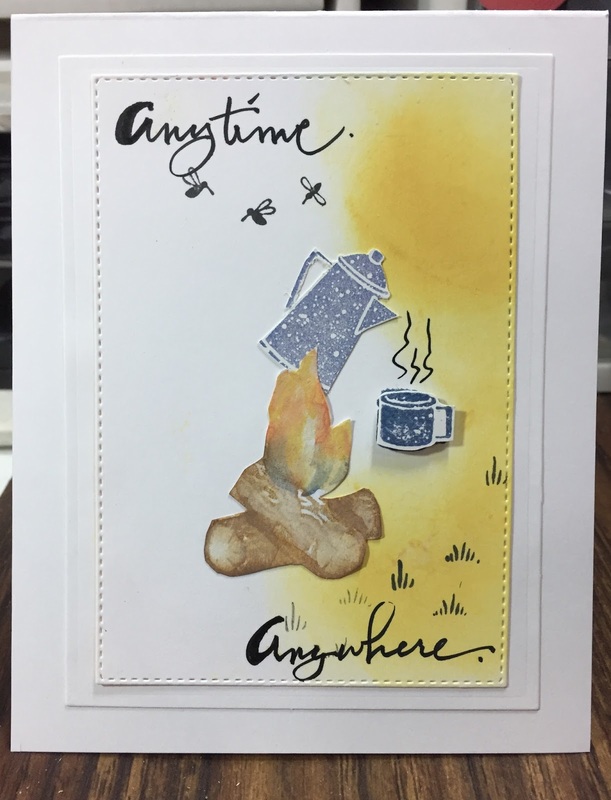 For this card I used Stampin Up's Roughing It stamp set, and fussy cut the fire and logs, coffee pot, and cup. The background is Distress Oxide ink in Fossilized Amber. The distress oxides worked better than I expected on the flames; I added a little Faded Jeans at the base. I also used Faded Jeans on the pot and cup, but to make the cup stand out I embossed it and used a pop-up dot. Wonderful interpretating of the summery coffee time! Great card design! What a lovely scene. This really takes me back to camping days!! Camp coffee is delicious too. Love this card. This is a really cute CAS card; love it! Very very cool! Love it!